Mark Cravens isn't one of those guys who looks stern and pickle faced all day. You know the type I'm talking about. The almost gloomy expression that shrieks of personal austerity, mortification, and of course holiness. If they smile it is only out of social convention or a need to be seen as polite, not out of any sincere desire. Well, that isn't Mark Cravens. Mark is someone who loves to laugh. He's always ready with a joyful and hearty greeting that leaves you with no doubt he means it. Put simply, he reflects the joy of God. Sometimes we can get so consumed in the pursuit of holiness that we become caricatures, forgetting how to express the full range of human emotion. There is something in the mind of humanity that makes us think that, if we are really holy, we become somber, "other worldly", and transcend the silly pursuits of life. All too often humor becomes one of the "silly pursuits" that gets jettisoned. Of course, this whole twisted line of thinking is at its core an attempt to become holy by our own merits; something that is often lost on those consumed by it. It is as if they seek to reject a part of their humanity. Is there something inherently sinful about humor? Not if we believe what scripture says. Cheer, laughter and joy are all gifts of God that, as scripture indicates, make our lives much brighter. This doesn't mean that our humor has no boundaries or guidelines. It clearly does. Laughter and humor must be focused properly. That is, they must not be used to heap scorn, insult, or to belittle anyone, but rather to express the joy we have in serving our Lord and each other. Scripture describes the misuse of laughter. "For as the crackling of thorns under a pot, so is the laughter of the fool.."
None of this, however, means that we cannot laugh. Laughter is a natural human expression of joy, when in its proper context of godly communication. Those who would look down on those who enjoy laughter and humor should really consider the experiences of Jesus. Does anyone really think that during his youth he never giggled and laughed at the playful things his mother did with him? Or do we think he and his friends never shared a joke while playing together or at school? Did he never sincerely smile or take joy in the reactions of those whom he healed? Or the families of those he brought back to life? What a frightening person that would have made him. If we indeed believe Jesus to have been not only fully God, but fully human, then how could we ever imagine him never sharing his laughter with his disciples and those who came to hear him? "It’s purely speculative whether or not Jesus laughed, but I can’t imagine that he didn’t laugh for this reason: He was fully human, and he was perfect. We certainly wouldn’t attribute to Jesus any sinful emotions or forms of behavior, and it would seem to me the only reason to think he didn’t laugh would be if we first came to the conclusion that laughter is evil." This sort of gnostic thought with regard to humor would militate against Jesus being fully human. Ecclesiates 3:2-4 tells us there is a time for everything; "A time to cry, and a time to laugh." 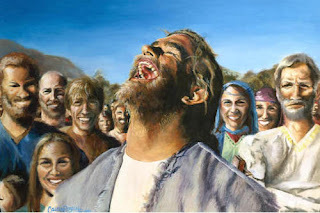 I'd like to think that since there is a time for laughter, Jesus knew that time and had a good, hearty laugh. Yes, Mark Cravens has taught me a valuable lesson through his unintentional example. Like Mark I hope to cultivate that sense of when to laugh, just like the God (Jesus) who very likely laughed. Well said, Jack! I certainly agree with your assessment of Mark. I count it a privilege to know him! Thank you, sir. He inspired me to write this brief devotional moment. I'm honored to know him as well.